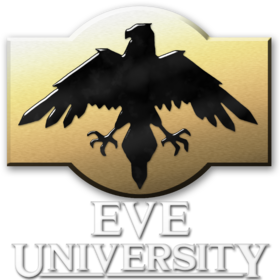 EVE University is a neutral, non-profit training corporation in EVE Online that exists to help teach players about EVE. With a primary focus on helping new players, EVE University has a well deserved reputation as the best place to get started in New Eden. Founded on March 15, 2004 at 14:33 by Morning Maniac, the University continues to uphold a strong reputation through previous wars, robust management, knowledgeable graduates and instructors, and quality students. The heart of the corporation resides in teamwork through wars, events, and cooperative help in the chat channel. EVE University is a founding member of the Ivy League Alliance. If you have just joined EVE University, see Welcome to EVE University for a guide to your first steps. more strength, more space, more ISK, more power. Many will take from others; without hesitation or mercy, without compassion or regret. Every day new capsuleers are born. But New Eden is a harsh place, and many are unprepared. that these new pilots are important, and enabling knowledge is worthwhile. EVE University, under entirely altruistic principles. is more important than the skillpoints, and 'more' is not the driving force. With its members freely teaching each other, they benefited from each other’s experience. Many moved on, but not before they imparted the knowledge they had gained. And as the word spread and members passed through the corporations doors, it became something else. language, cultural and regional barriers, with alumni all over New Eden. It had become something that will endure until the last of the stars goes dark. we can teach those new generations of capsuleers. Together, we can prepare them better than any guides or agents can. Together, we can give them the best start possible, without limiting their options. Together, we can instil in them the skills needed not only to survive, but to be successful. We do this not for power, or influence, or money. We do this because we too recognise that 'more' does not have to be the solitary goal. We do this because we are EVE University. This page was last modified on 22 March 2019, at 14:38.